Many of my favorite dishes are the ones that have the ability to transport. You inhale, take a bite, and suddenly you’re not sitting at your kitchen table anymore, you’re off exploring the world or being whisked back a couple of decades and remembering a dinner you ate half a lifetime ago. This soup is one of those dishes; it’s a soup that transports. As soon as it started to simmer, I breathed in, and thought, “ahhh…Italy”. While it’s not a replica of any dish I’ve eaten on Italian soil, the smell of squid and artichokes bubbling away in white wine and too much/just the right amount of olive oil smelled so unmistakably Italian. 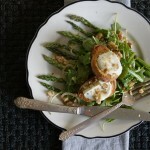 Immediately, I was flung from my dreary Minnesota kitchen, into the warm Mediterranean sun. This soup is from one of Marcella Hazan’s cookbook and it’s a perfect example of how a few ingredients can turn into something really beautiful when treated with care. 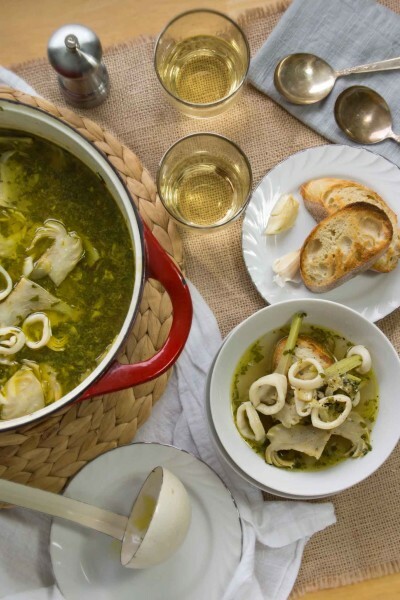 All you need is some calamari, a pair of artichokes, white wine, garlic, and parsley. Start by warming (an admittedly abundant amount of) olive oil with minced garlic. 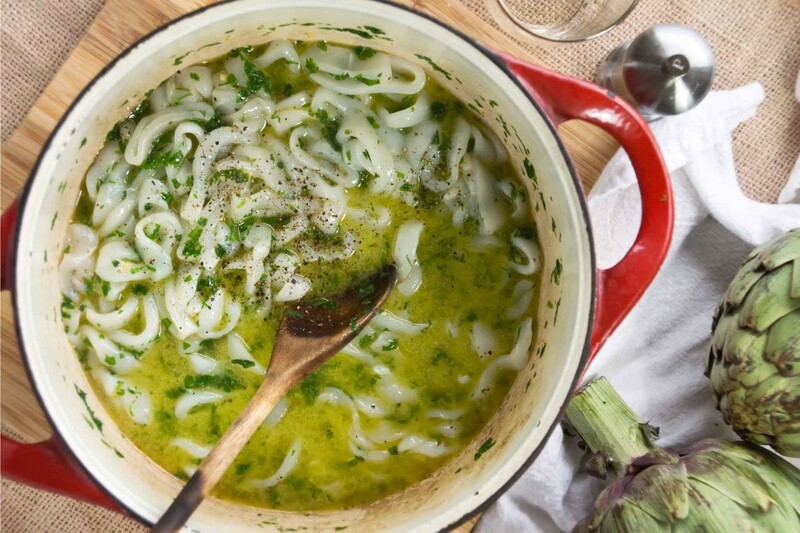 Stir in a handful of chopped parsley, rings of calamari, and a glass of white wine. I’m sure you know the rule with cooking calamari–either quick and hot or low and slow otherwise it’ll get rubbery. We’ll go slow for the soup and cook the calamari over a low flame until it is very tender. While the calamari is doing its thing, work on cleaning the artichokes. It always makes me sad to start hacking away at such a pretty vegetable, but for something like this, it pays to be ruthless. Snap off the leaves, cut off the tops, scrape out the choke, peel the stem. 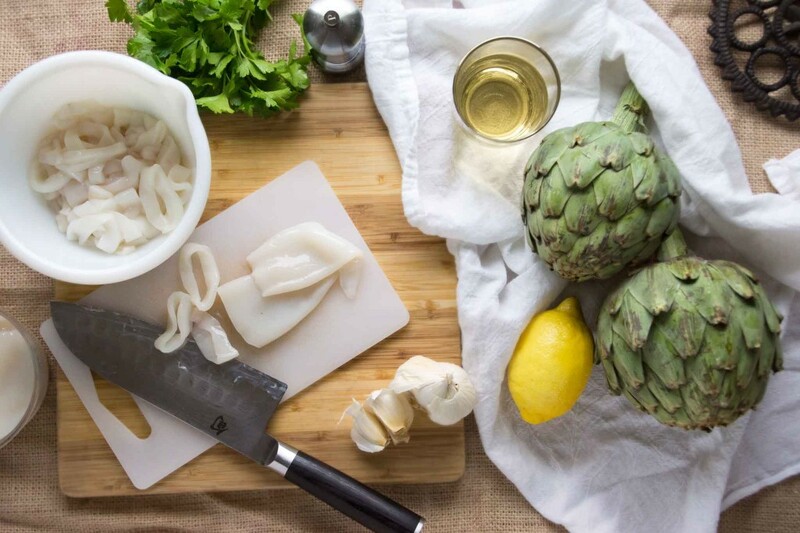 Slice the artichokes into thin strips and add them to the simmering calamari. While the artichokes are cooking, toast up a few hearty slices of bread and rub them with a smashed clove of garlic. 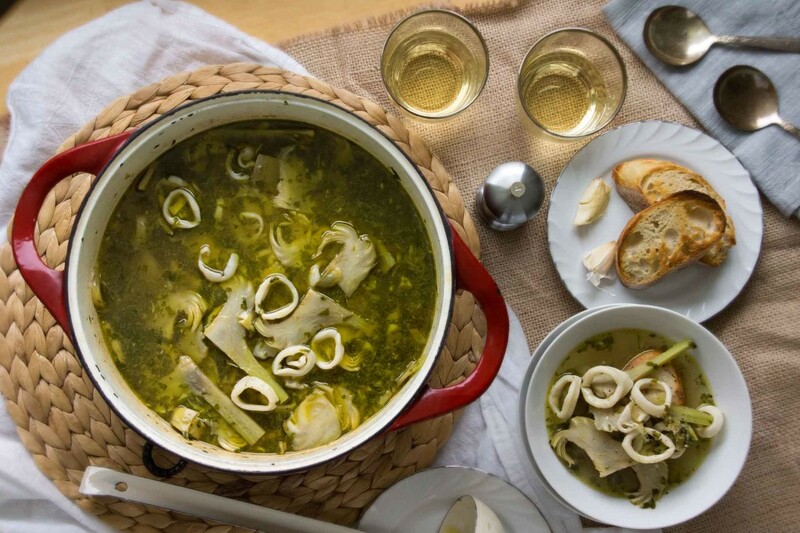 Line a soup bowl with the garlicky bread and ladle the calamari and artichoke soup over the top. Pour yourself a glass of wine and take in all in. Do you feel that sea breeze on your face, smell the salt in the air? Yes? Good, the soup is working its magic–the pleasure of a quick trip to Italy from the comfort of your own kitchen table. As soon as this soup starts simmering and the smell of olive oil, garlic, white wine, seafood, and artichokes fills the kitchen, my head is officially in Italy. On the coast. Soaking up the warm sun and sea breeze. Drinking wine, having fun…what's not to love? Put the oil and the garlic in a large pot or Dutch oven and gently warm over medium-high heat. Cook, stirring occasionally, until the garlic is fragrant and lightly golden, 6-8 minutes. Stir in the parsley, then add the calamari and toss to coat. Add the white wine, a generous amount of freshly ground black pepper, and enough water to cover the calamari by an inch or so (about 3 c.). Bring to a simmer, then reduce the heat to medium-low, and cover. Cook until the calamari is quite tender, about 40 minutes. While the calamari cooks, clean the artichokes. Fill a medium bowl with water and the juice from half of the lemon. Keep the other half of the lemon to rub on the cut parts of the artichoke as you work to keep them from discoloring. Snap off the tough outer leaves until you reach the more delicate pale green leaves. Cut off the top of these leaves, exposing the purple choke. Use a spoon (I like using a grapefruit spoon with its serrated edge) or a paring knife to pull out the prickly purple leaves and the fuzzy choke. Run the paring knife around the outside of the artichoke to remove any remaining dark green bits and strings. Finally, trim the bottom of the stem and use a vegetable peeler to remove the tough string exterior of the stem to reveal the paler, tender center. Place the cleaned artichoke in the lemony water while you repeat the process with the second artichoke. It’s a tedious task, but it pays to be ruthless and really get at those tough bits so you’re not pulling them out of your mouth as you sit at the dinner table (gross!). When both artichokes have been cleaned, cut them lengthwise in very thin slices, leaving the stem attached wherever possible. Return the sliced artichokes to the acidulated water. When the calamari is tender, season with salt. Drain the artichoke slices and add them to the pot. Add a bit more salt to season the artichokes and another cup or 2 of water so that the ingredients are covered by at least an inch. Cover the pot and continue to cook over medium-low heat until the artichokes are tender, 15-20 minutes. While the artichokes are cooking, grill or toast the bread until golden. Smash a piece of garlic and rub over the warm bread. When the artichokes are tender, taste and adjust the seasonings, if necessary. 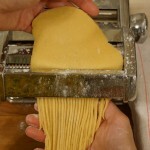 Place a slice or 2 of the toasted bread in the bottom of each soup bowl, pour the soup over it, and serve immediately. 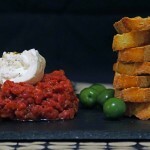 I want this for lunch…. preferably in Italy!!!! How about at my house instead?